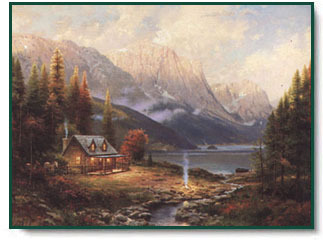 Price includes your choice of authentic Thomas Kinkade frame. "When a morning dawns so bright, so clear, so bursting with beauty that you can't help but pause to celebrate God's wonderous creation - that is my idea of the Beginning of a Perfect Day. My new painting celebrates just such a morning. Dappled sunlight touches the treetops, leaving the valley in shade; the mist rising from icy waters melts into the clear, warm air of day. The campfire promises a hearty breakfast; a boat ebbing on shore whispers of plump brook trout waiting to strike; horses grazing nearby coax us to ride the mountain trails into the magnificent peaks that loom on the horizon. Beginning of a Perfect Day is not for one day only, but for a season, a lifetime. For me, it's a lovely anticipation of a trip Nanette and I have planned with our young family. This summer, we're taking the girls on a painting trip to Lake Louise in Canada's Alberta province. I can almost see the mountain majesty, smell the crisp, pine-scented air, taste fish on the fire. Beginning of a Perfect Day also launches a new print series, alive with the exhilaration of morning in the wilderness. I can't wait to see what each new "perfect day" brings!" 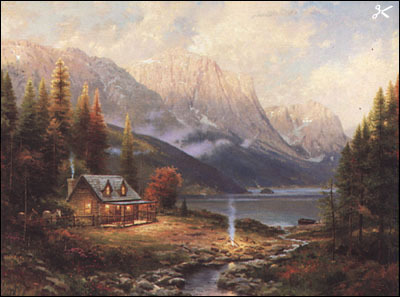 Beginning of a Perfect Day copyright© 1996 by Thomas Kinkade.